The Tate Modern is now 10 years old. According to this great article in The Times recently, it’s the most popular art venue in the world and one of the top three attractions (!) in the country (whatever that might mean), though it doesn’t mention what its rivals are. I’ve never been a fan of the building myself. I have always felt that it’s an opportunity wasted. Pre 2000, when I heard the building was being converted for use as a gallery I was quite excited at the prospect, but when I went there I was so disappointed. And ten years on I still hold that view. It’s the conversion of building itself that I have got the problem with, not the contents. Logic says that the main access to the building, and then to the art, should be through the door facing the river, especially if you have just walked across the Millennium Bridge. But no; if you use that door you will end up confused for a while wondering which way to go, trying to find a sign or a map to direct you to the art. On looking down into turbine hall you realise you may have to go down to go up. Hmmm. Once down there you'll realise the bulk of the art is on the floors above, so you then have to take a ride on a very long escalator like an extra in Fritz Lang’s Metropolis. At the top of every escalator on every floor it feels, to me, like being in an institution or a hospital. There are some great works of art up there but the effort involved always seems to me to diminish the enjoyment. In case you are still wondering, the main entrance is what looks like the delivery/service doors down the ramp on the west side of the building. Access by this route brings you directly into the vast turbine hall that almost everyone else (I am aware that I am so in the minority here) cites as so amazing. It seems to me to be just a big redundant space; the only way of using it being to commission works to fill its cavernous hole. I just don’t agree with a gallery commissioning art in this way. I have seen a few of the commissions and felt either that they were diminished/dwarfed by the building or that they reeked of commerciality. Could this fantastic space not have been better used with rooms at high levels on the south side connected across the turbine hall by walkways? Something like Musée D’Orsay in Paris? Had they done something like this perhaps the need to spend money on the new extension wouldn’t have been necessary. But, again, I’m no architect, what do I know?! Call me old fashioned but I like to walk into a gallery and be immediately tempted or distracted by what I can see through a door to the left, or the hall ahead. Tate Britain and the National Gallery, for instance, achieve this with ease and are always a pleasure to visit. You are ‘in the art’ within minutes. Last year I was discussing all this with a friend on the down escalator at Tate Modern. A fella behind us joined in and said he totally agreed with me as he always liked to refer to the building as “A really good bookshop with an art gallery attached”. I couldn’t have put it better myself. 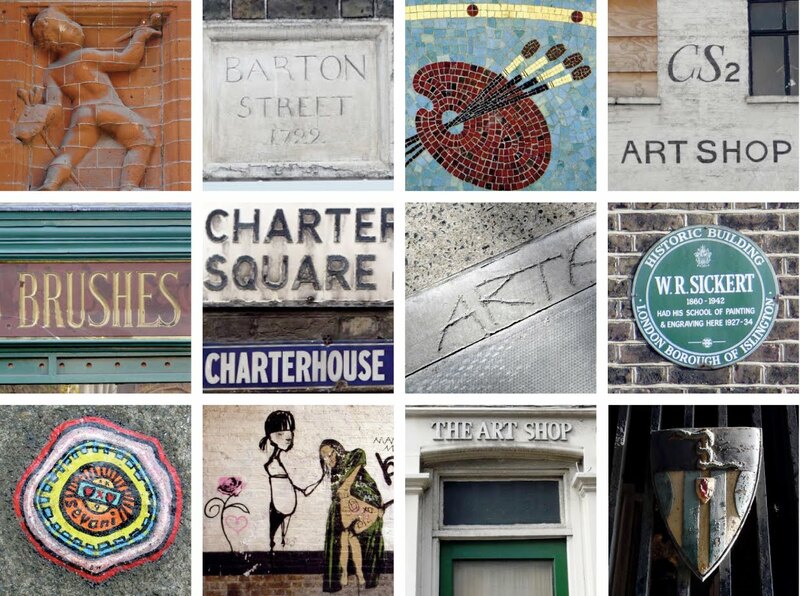 Top row: Cleveland Square, W2; Barton Street, SW1; Reeves & Sons Ltd, Ashwin St, E8; Camden High Street, NW1. Middle row: Orford Road, E17; Charterhouse Square, EC1; Westbourne Terrace, W2; Highbury Place, N5. 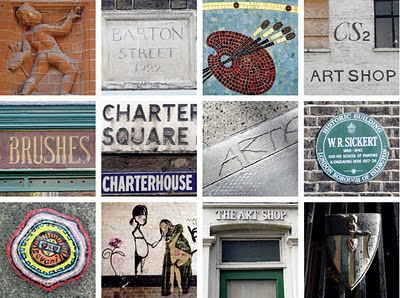 Bottom Row: Crouch End Broadway, N8; Rivington Street, EC2; Farringdon Road, EC1; St Barts, EC1. A Belated Happy Birthday to David Attenborough!